Floating4Market is Pattaya's newest theme park featuring the best of each of the four regions of Thailand - North, Northeast, Central and Southern. This amazing recreation of traditional Thai culture demonstrates trading practices of yesteryear. 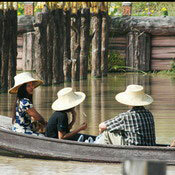 Covering an area of almost ten acres, this attraction houses many small floating boats that sell a variety of handicrafts. The market is divided into four distinctive zones that offer different arts and crafts from various areas around Thailand. Visitors can climb aboard a boat and maneuver around the floating market place, browsing through an amazing selection of trinkets, lacquerware, and other handmade items. 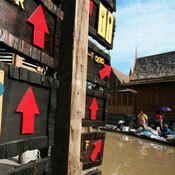 The attraction offers the floating market during the day and a shopping bazaar at night. This is a great experience for those that want to learn more about traditional Thai trading and cultural practices. 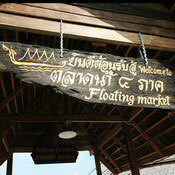 Pattaya Floating Market is open every day from mid-morning to midnight.